Grandma Pizza Recipe – NY Style! Ah, the smell of Grandma's Pizza baking! There is nothing like it. Grandma pie is one of my very most favorite pizzas. A Grandma Style Pizza is kind of like a margarita pizza, on a crust that is similar to but not quite Sicilian pizza. The Sicilian pizza crust is thicker. The grandma pizza crust is not as thin as Sicilian pizza, but thicker than the standard Neapolitan pizza. This Grandma Pizza Recipe is topped with pieces of fresh Basil, so in a way it is a Basil Pizza, as well. 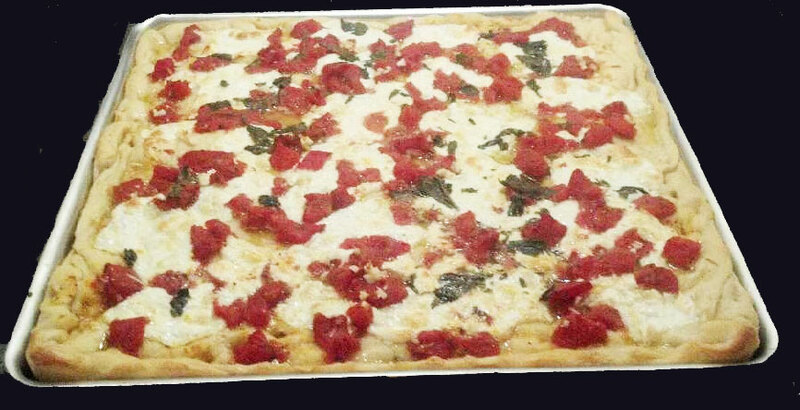 Many here in New York say that once you have a Grandma Pizza, you will not want the ordinary pizza again. That may actually be a true statement, but I haven’t met a pizza in NY that I don’t like. None the less, a New York Grandma Style Pizza is most probably my very most favorite. The aroma of a Grandma Style Pizza cooking brings back memories of long ago, when my Grandmother used to make this pizza in our small oven, when I was a small child. 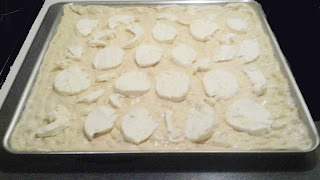 In this post, I am going to share with you my grandmother's pizza recipe as she taught it to me. In fact, this grandma style pizza recipe was in my family as long as I could remember. We just simply called it pizza. In order to make this Grandma Pizza Recipe, you would use a rectangular pan, similar to Sicilian Pizza. You can order one here. Part of the secret of making Grandma Pizza is that the dough is oiled underneath, so that it kind of gets fried when it is baking. Also, fresh mozzarella is key here. Not the shredded, or block, but the ball that usually comes in water. If you can get buffalo milk fresh mozzarella for your Grandma Pizza, all the better. In addition, in my opinion, lots of either fresh or roasted garlic and fresh basil is mandatory for traditional Grandma Pizza Recipes. Some places make this without garlic! Some without basil! That is entirely wrong, and those folks should be ashamed of themselves. Really! A note on the basil: Dried basil and fresh basil taste entirely different. Be sure when you buy basil, do not refrigerate it, as it will turn black. Now, I grow my own basil using organic growing methods. It is easy to grow, and grows well next to tomatoes. They are kind of like friends. But, this is what you can do, so that that fresh basil taste is available to you all year. Pick off the leaves and wash well. Layer the basil in wax paper and freeze it. When making this Grandma Pizza, you can take out the frozen basil leaves and crumple them on top before cooking. If you like,you can watch my..
All of these ingredients are to taste, and dependent on the size of your Grandma pizza, use your best judgement. • Plum tomatoes, skinned. Organic Tomatoes Make A HUGE Difference! • Garlic, either fresh or roasted, chopped. The more the merrier! Place your tomatoes in a strainer and drain them for at least a half hour. You want to remove as much of the moisture as you can from the tomatoes. Moisture will make your Grandma Pizza soggy, which is what you don't want. Be sure to strain as much of the Tomato Water off as you can. Oil your pan with a quality olive oil. 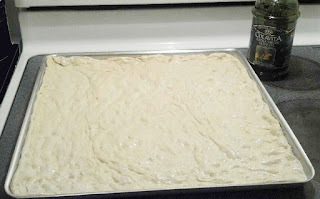 Press the pizza dough into the pan so that it is all the way to the edges and up the sides. 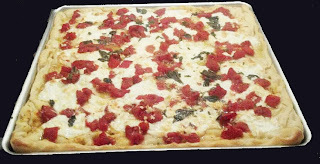 Traditionally, Grandma Pizza is made in a square or rectangle shape. If all you have is a round pan, you can use that, but it may resemble a deep dish pizza, instead of a Grandma Pizza Pie. Place your mozzarella on top evenly across the top of your Grandma Pizza. Your pizza pie should look like this now. Sprinkle a generous amount of garlic and a small amount of dried oregano over top of pizza. I prefer just a little oregano on a grandma pizza. While you can use as much as you want, it is my opinion that some restaurants use entirely too much. After you have put the garlic, cheese and oregano on your grandma pizza, it is time to top the pizza with tomatoes. In many standard pizzas, the tomato sauce is under the cheese. In a grandma pizza, the cheese is put on the pizza first. Squeeze the tomatoes by hand to crush them, and squeeze out additional water. Place the crushed tomatoes on top of the grandma pizza. Sprinkle sea salt to taste. I think it is important to determine how salty your cheese is. Hopefully you tasted it. Who can resist? Sprinkle what you think is right on your grandma pizza, remembering that less is more. You can always add more later. Add the fresh or frozen basil on top of the pizza. 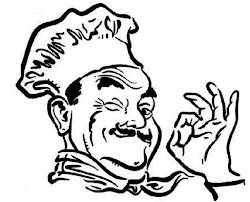 Alternatively, you may opt to add the basil to the top of the Grandma Pizza immediately after it comes out of the oven OR add a little going into the oven and more when it comes out. I would recommend that if you are using frozen basil to make your grandma pie, put it on prior to putting it in the oven. Drizzle some olive oil on the top of the grandma pizza and under the edges of the dough. Place pizza in oven, on top of the stone if you are using one, and bake for about 20 minutes, until golden brown. The thing that makes this grandma pizza recipe special is that the pizza dough is fried in the olive oil when the pizza is baking in a hot oven. The bread stone distributes a even heat along the entire bottom of the pizza pan. Enjoy the aroma while this delicious grandma pizza is cooking. This is what I refer to as Italian Aroma Therapy! When your Grandma Pizza is finished baking, remove it from the oven and top it with lots of fresh basil leaves. Allow it to cool for about 5 minutes. Then, cut your grandma pizza into rectangles, using a standard pizza cutter. Although a stone is not a complete necessity, it will assist in all of your bread and pizza making. I love my bread stone. You can get great results without one, but having one will put it over the top. I hope you enjoy this Italian masterpiece, called Grandma Pizza. This Grandma pie is out of this world. Please feel free to modify this grandma pizza recipe to suit your tastes. I presented what I was taught to me from my Grandmother, here, but you can certainly adapt it to your liking. HI, Does this mean if using the Pizza Stone , you place the dough directly on the stone when baking or you still have in the pan but the pan on top of the stone? You put the pan directly on the stone. One of the qualities of a Grandma Pizza is that the dough is kind of fried in Olive Oil. You are oiling the pan and then again under the edges of the dough. When cooking, the stone will heat the pan very evenly and fry to dough in that thin layer of olive oil between the pan and the dough. This would be impossible if the dough was directly on the stone, as in a Neapolitan Pizza. If you wanted to make a Margarita Pizza, you would basically follow the same thing here, but put the dough directly on the stone, without the oil. I hope that answers your question and inspires you to try this recipe. Let me know how you make out, and feel free to ask any other questions. nice video & recipe much like the way my family makes this...but we use basil, not oregano. may try your way next time. Wow! I mentioned basil in the top and I use it in my video, but I forgot to list it in the ingredients! Use basil and a lot of it, like I did in the video! Thanks for the heads up! I will fix it. Thanks for asking and stopping by. If using a large pan like I am, you may need a double or 1.5 doughs. A smaller pan like most people use need 1 dough. Shrimp Scampi - Doesn't everyone love this dish? Fondue - Cheesy, Yummy, What's not to like? Ciabatta - Eating Grandma's Slipper! Artisan Bread Recipe with NO KNEADING! - Really! Calzones - Is there anything better? Focaccia - The grandparent of the modern pizza!